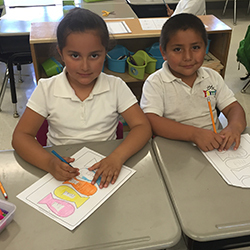 Students in Robin Rodriguez’s kindergarten classroom in Pacoima, CA, begin each week discussing their answers to questions like these as a way to learn about each other and begin to understand empathy and compassion as part of the Mutt-i-grees Curriculum. Robin, who is a member of the Mutt-i-grees leadership team at Fenton Primary Center, one of the original pilot sites for the Mutt-i-grees Curriculum, teaches a Mutt-i-grees lesson every Monday. 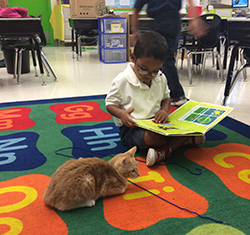 Robin is one of the first educators in the country to implement lessons from Cats are Mutt-i-grees 2, one of our newest educational initiatives. A companion to the Mutt-i-grees Curriculum, Cats are Mutt-i-grees 2 can be used as a freestanding educational program or to extend the lessons in the core Curriculum. 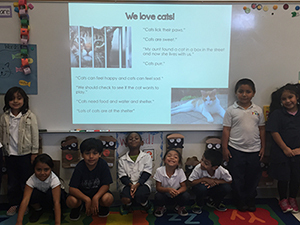 The activities included enable students to become aware of cat characteristics and behavior as well as the needs of cats, especially those awaiting adoption at animal shelters. For Robin, using the Cats are Mutt-i-grees 2 lessons alongside the core lessons helped her to reach students at their interest level. “Some students gravitate more towards dogs, while others have a special heart for cats. This curriculum really supports both,” she explains. Her favorite part is the Cat Dialog feature lessons. Similar to the Dog Dialog feature lessons in the Mutt-i-grees Curriculum, the Cat Dialog lessons introduce students to basic aspects of feline characteristics and behavior. The lessons provide a context within which teachers can offer ways for students to get to know and encourage empathy for cats. In fact, this year, Robin’s class had an opportunity to put the lessons they learned from the Mutt-i-grees Curriculum into action. In September, Robin and her students rescued a young kitten from the street during school dismissal. They comforted the scared cat, who they named Henry, and Robin brought him to the vet to tend to his medical needs. A friend of Robin’s fostered Henry for a month until he found a responsible, loving home with a Fenton teaching assistant. Rescuing Henry had a profound impact on Robin’s students. She says two children rescued other cats from the street and families in her community are making the responsible choice to adopt from animal shelters rather than buying pets from pet stores. “I really believe that the firsthand experience of helping save Henry shaped my students’ view of animals and how we can be responsible citizens,” Robin says. According to a recent survey, there are 86.4 million cats and 78.2 million dogs in homes across the country, with many families enjoying the company of both cats and dogs. 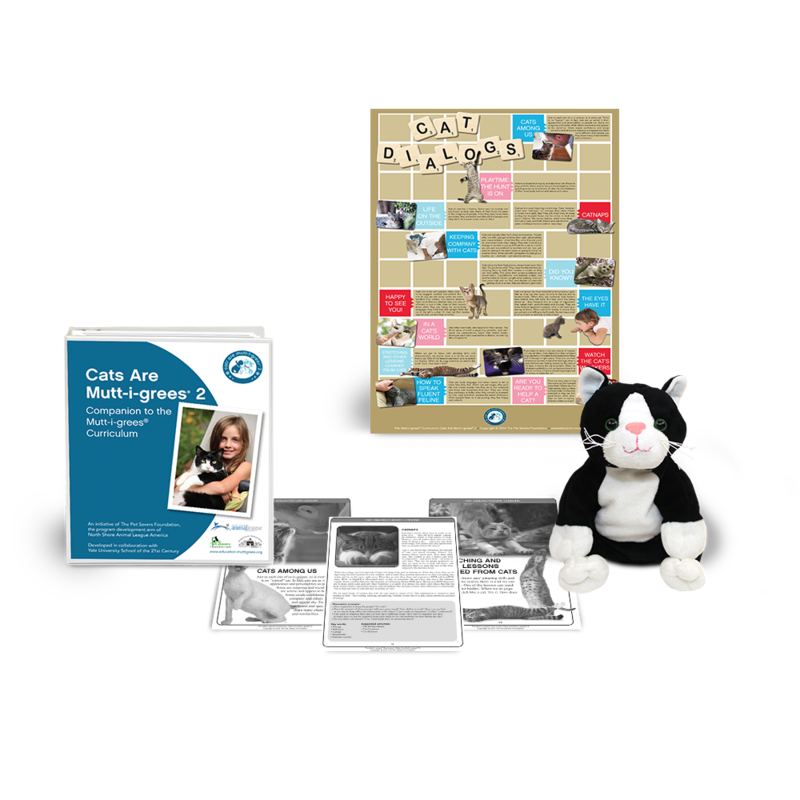 This kit includes information about the characteristics, behavior, and needs of cats, especially those awaiting adoption in animal shelters. It features two sets of fun activities for grades PreK-6 and 7-12, and presents grade-appropriate information about feline issues from overpopulation to declawing. Educators can use this kit in conjunction with the Mutt-i-grees Curriculum and its ancillary programs or as a freestanding program in schools, YMCAs, afterschool programs, and summer camps. Live animals are not necessary for successful implementation.